As Denver continues to grow some are worried it may turn into a heat island. Large areas of Denver overhauled to sustain an exploding population now are so built up and paved over that residents rapidly are losing contact with nature. 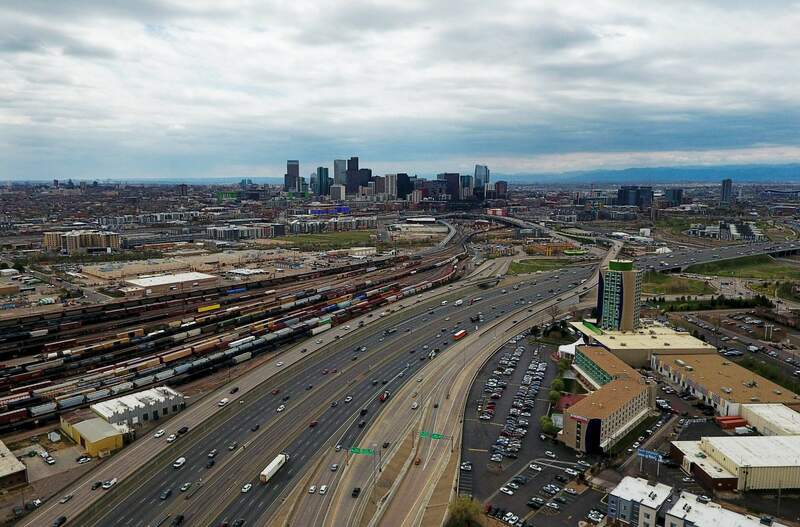 Excluding the undeveloped area around the airport, nearly half the land in Denver’s city limits is now paved or built over – up from less than 20 percent in the mid-1970s, a Denver Post analysis of city and federal data found. And that figure could approach 70 percent by 2040. DENVER (AP) – Tent-hunting at REI, Jackie Von Feldt and her friends lamented that they choke inside booming Denver and were preparing an escape. Large areas of Denver overhauled to sustain an exploding population now are so built up and paved over that residents rapidly are losing contact with nature. Excluding the undeveloped area around the airport, nearly half the land in Denver’s city limits is now paved or built over – up from less than 20 percent in the mid-1970s, a Denver Post analysis of city and federal data found. And that figure could approach 70 percent by 2040. Green space in Denver is disappearing faster than in most other cities, with paved-over cover increasing from 19 percent of the city in 1974 to 48 percent in 2018 (not including Denver International Airport), federal and city data show. Up to 69 percent of the city is expected to be paved or covered by 2040. Only New York and a few mega cities exceed that level of what planners call “imperviousness.”Denver ranks nearly last among major U.S. cities, including New York, in park space as a percentage of total area. It also ranks nearly last in park acres per resident.City leaders are overriding residents’ desire for increased green space as they sign off on more high-density development.The dwindling of nature in Denver could lead to potentially overwhelming increases in stormwater runoff, and is causing worsening heat-wave impacts and likely hurting residents’ physical and mental health.The situation has reached a point that clashes with the “green” images Denver economic development officials project to promote growth, tourism and the outdoor recreation industry. “There’s a ton at stake. This is something to be concerned about – not just for some big net loss of biodiversity, but for what it means for people to interact with nature on a regular basis,” said Liba Goldstein, a Colorado State University conservation biologist who has helped guide efforts to nurture nature north of Denver in Fort Collins. “We benefit from regular interaction with nature. It is good for human health. . We all know we have big obesity and mental health problems on the rise in cities. As people are more and more connected to computers, technology, and less and less connected to nature, it is harder to generate interest and enthusiasm and curiosity in young people,” Goldstein said. Bob Taylor, a scientist with USGS, uses a special tool to measure heat around homes and building in Denver on April 26, 2018. Large areas of Denver overhauled to sustain an exploding population now are so built up and paved over that residents rapidly are losing contact with nature. Denver’s transformation has been happening gradually, and The Post – analyzing city and federal data, interviewing officials and developers, talking with residents – tried to determine the cumulative impacts. A city increasingly ‘impervious’The pace of Denver’s shift from natural to an increasingly built urban environment – roofs, roads, parking lots, park trails, other ground coverings – may be accelerating. In 1974, 19 percent of Denver was built over, according to federal U.S. Geological Survey data. In 2012, about 32 percent of that area was covered (roughly the same as the broader Denver/Aurora area tracked by USGS), the city and federal data show. 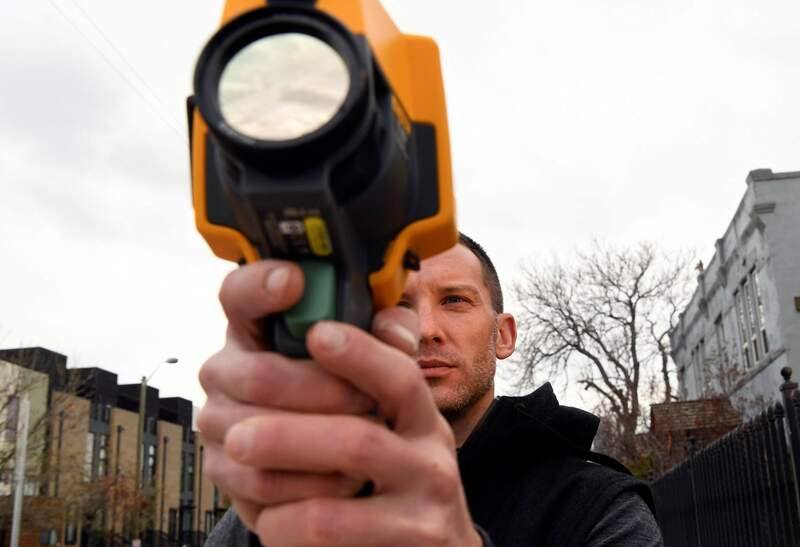 “You’re looking at 95 percent imperviousness now in the newly developed parts of Denver – a very high rate,” Muller said in an interview. Less room to roamDenver’s 155-square-mile area includes 6,238 acres of parks and open space (the city counts 831 acres of golf courses, 137 acres of road medians and 204 acres for future parks), which is 6.2 percent of the total area, an inventory provided to The Post shows. That ranks the lowest among major U.S. cities, according to Trust for Public Land rankings, which used an 8.2-percent figure for Denver. The city also owns about 14,000 acres of non-contiguous park property in the mountains. The rapid population growth in Denver – the city has added nearly 10,000 new residents a year since 2010 – intensifies the impact. Park space per person in Denver has fallen to 8.9 acres per 1,000 residents, down from 9.4 acres per 1,000 residents in 2006 and 9.5 acres per 1,000 residents two decades ago – far below the national average of 13.1 acres per 1,000 residents, city data show. (By comparison, Portland offers 23 acres per 1,000 residents.) Denver officials project the acreage will decrease further to 7.3 acres per 1,000 residents as Denver’s population tops 857,000 before 2040. Yet Denver stands out as one of the only major cities in the U.S. that has not drawn on public funds to expand public green space – until voters in November approved a ballot initiative establishing a sales tax that will raise $45 million a year to go toward parks. In addition, Denver’s rules for developers rank among the most permissive when it comes to installing buildings without a requirement to offset impact by establishing new public green space. Only “master-planned” development on parcels larger than 10 acres – relatively rare – must leave 10 percent of the total area open, according to city community development officials. That open space, under Denver’s current rules, can include paved-over courtyards or plazas. For example, city officials recently told high-rise developers they could include construction of recreation center buildings as part of their required parks and open space. Excluding the undeveloped area around the airport, nearly half the land in Denver’s city limits is now paved or built over, a Denver Post analysis of city and federal data found. And that figure could approach 70 percent by 2040. Higher and hotterOne result of all this is that Denver’s denser urbanization exacerbates climate-driven heat waves. CU urban design researchers determined that Denver’s temperatures have increased by at least 3 degrees over the past two decades — above the increase from global warming. 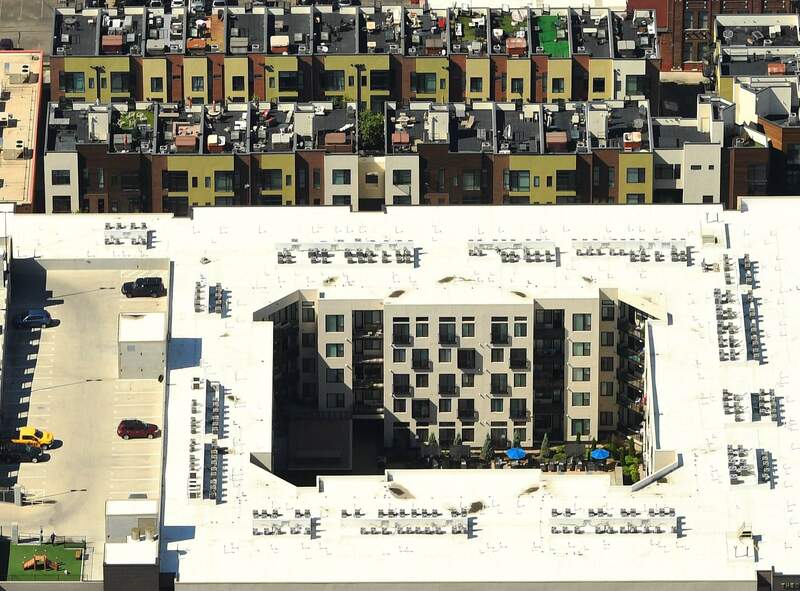 When more surfaces are paved or covered over, temperatures spike because concrete and asphalt absorb sunlight and then release it, the urban equivalent of a hot pack. Rising discomfortDenver officials are approving denser development even though residents object. Parks of the futureDevelopers in Denver acknowledged a shift toward greater density and less green space. A balance is possible – if cities prioritize creating more green space, said Mike Zoellner, president of the real estate company ZF Capital and vice chairman of the Urban Land Institute Colorado, which encourages smart urban design. Blaming population growth, lack of fundsDenver leaders say soaring land prices and population growth limit their options to preserve nature beyond limited landscaping. Parks department officials said they lack funds to establish green space, even though general fund revenues have increased rapidly as a result of the development boom. 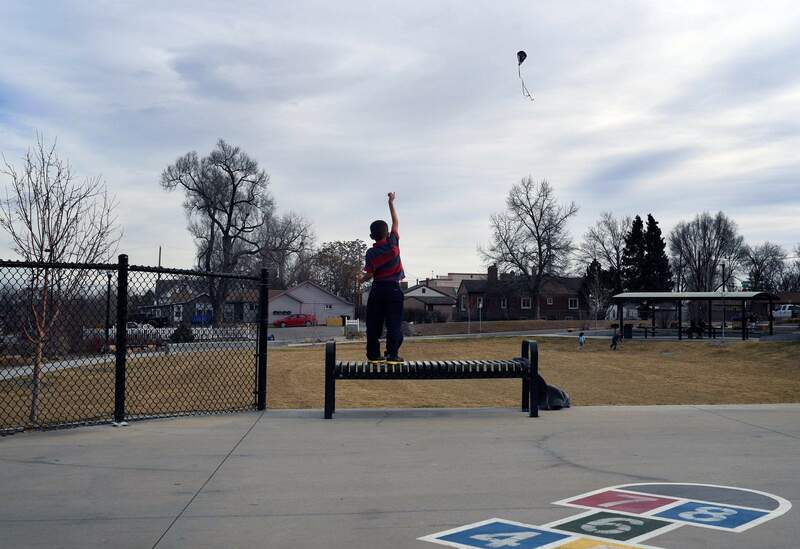 Parker Alley, 7, flies a at Four Winds-Cuatro Vientos Park, in the Westwood neighborhood in Denver, on Dec. 21, 2018. Large areas of Denver overhauled to sustain an exploding population now are so built up and paved over that residents rapidly are losing contact with nature. The great escapeFor residents, the green-space crunch compels frequent escapes in vehicles. It favors those with the economic power to reach nature. Yet those who flock out for recreation in the mountains increasingly face crowds, trampled terrain and impaired natural processes. The annual visitation at Rocky Mountain National Park, 90 minutes northwest of Denver, has increased by 60 percent since 2008. Boulder officials say they see more Denver residents heading onto their foothills trails.